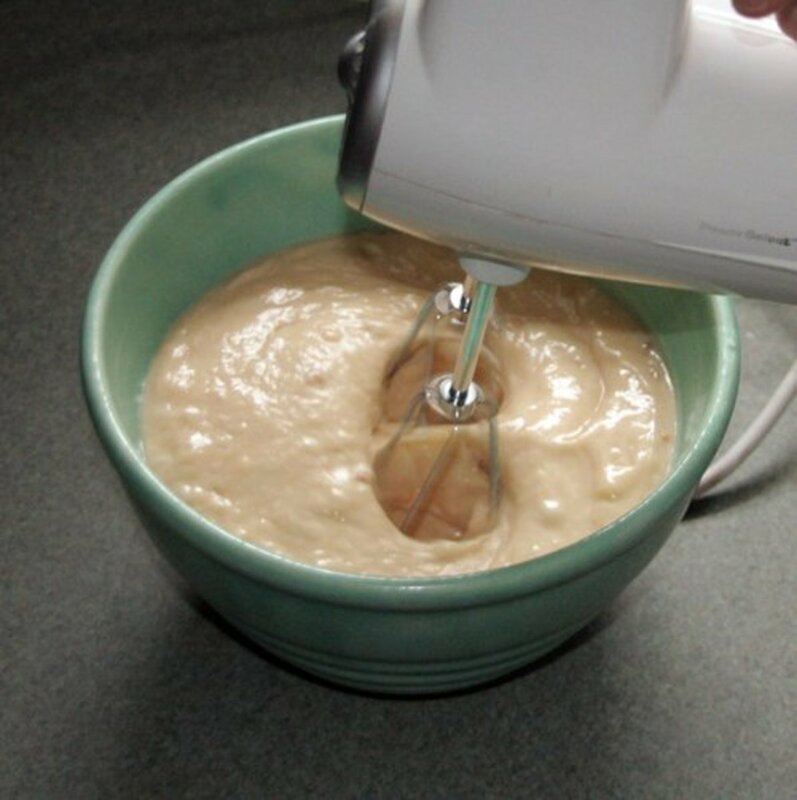 Yogurt, banana, peanut butter and honey are the basic ingredients in the Frosty Paws recipe. In today's Internet age, it's the rare "dog mom" who hasn't purchased, made or at least heard about Frosty Paws® for dogs. Those who haven't have been missing out, or more perhaps accurately, their dogs have been missing out! Frosty Paws® are creamy, nutritious, healthful (but unfortunately somewhat expensive) frozen treats that dogs adore. Enjoyable year round, they're especially welcome in the summer months as they're the canine equivalent of ice cream. Homemade versions, which lack preservatives, are more healthful than store brands, and cost less as well! Mix all of the ingredients with a blender or mixer and freeze in ice cube trays. Small paper cups and disposable egg cartons also make good molds. When frozen, microwave for a few seconds, unmold, and place the treats in a plastic bag and store in the freezer. (Note: if using Styrofoam egg cartons or cups, rest the containers briefly in a partially filled pan of warm water to loosen contents. Unless the Styrofoam is labeled as microwave safe, it could melt.) If you want to be fancy, bone and paw shaped molds are available. Combine the ingredients with a mixer or blender. Egg cartons make good molds. This is where the fun part begins! Using only the yogurt as a base, there are any number of ways to vary the original recipe. You're only limited by your imagination. Because these treats are frozen, their consistency is less important than when experimenting with baked goods. Below are a few variations my own dogs have heartily endorsed. 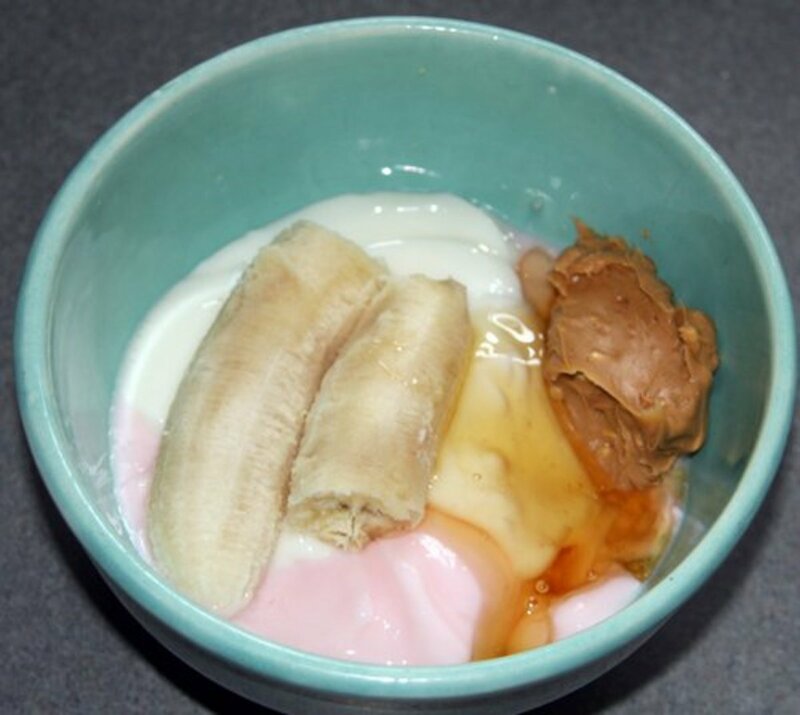 Use fruit and flavored yogurt instead of plain. I've used vanilla, blueberry, and strawberry/banana with good success. Mix the yogurt with a packet of low sodium powdered chicken bouillon (Herb Ox has sodium free chicken granules) and a cup of low sodium chicken broth. One large jar of baby food is approximately equal to one banana. So instead of the banana, use the baby food of your choice. My dogs LOVE meat baby food. Unfortunately, this only seems to come in small jars. Use three or four jars of the meat of your choice in place of the banana, peanut butter and honey. Puree the yogurt in a blender with a can of mackerel or salmon. Scramble or boil several eggs, and puree them with the yogurt. You can use raw eggs, but then enters the (small) risk of salmonella poisoning. (I occasionally use raw eggs, but I raise my own free range chickens and have control over the cleanliness of their nests.). Raw egg whites destroy biotin, a necessary B vitamin. Raw egg yolks, however, are a rich source of biotin and offset the raw egg white. Do not feed raw egg whites by themselves as over time this practice could lead to a biotin deficiency. Puree the yogurt with raw chicken or beef liver. Raw liver purees with ease. Liver is rich, and a little goes a long way. Too much will give a dog diarrhea. You get the idea ... you truly ARE only limited by your imagination! For dogs on a diet, or who cannot eat dairy, instead of yogurt, defatted chicken broth may be used as a base. This is easy to make. Place a whole chicken in a big pot and cover with water to which you have added carrots, garlic, and low sodium bouillon.Cover, bring to a boil, then reduce heat and simmer until cooked, approximately one hour. When done, remove the chicken, strain the broth, and refrigerate overnight. The fat will rise to the top and harden.The next day, skim off the fat. What remains is your broth base. The broth alone makes a nice doggie Popsicle, but jars of meat baby food, canned fish, cooked eggs, or diced, cooked chicken, are all great additions. Sometimes I hide a small cooked treat in the half frozen broth when I use the broth alone. Save chicken carcasses in the freezer until you have several, and then put them into a pressure cooker with enough water to partially cover. Cook at fifteen or twenty pounds of pressure for an hour and a half. When cool, the bones are so soft that they "mush" when touched. Transfer the contents of the pressure cooker to a blender or food processor and process until smooth. Mix the bone puree with equal quantities of defatted chicken broth, place in molds, and freeze. My dogs love these. Yours will too! 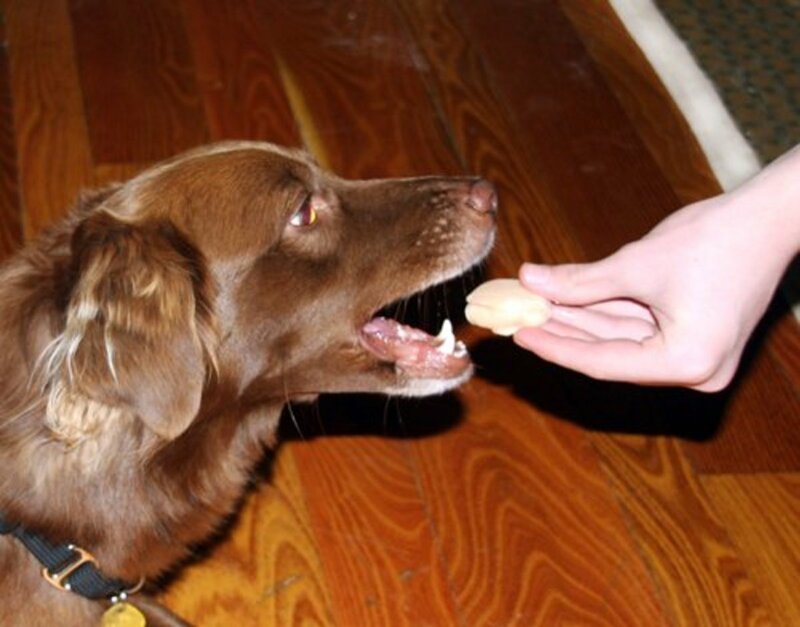 This Australian Shepherd is about to enjoy a homemade "Frosty Paws" treat. Several commenters have expressed concern over possible additives to meat baby food being harmful to dogs, so I did a little research. Gerber® is a national brand that sells four meat foods (Beef & Beef Gravy, Chicken & Chicken Gravy, Turkey & Turkey Gravy and Ham & Ham Gravy) in their 2'd Foods line, and they all have only three ingredients: meat, water, and cornstarch. This product should be on the shelf at your local grocery store! 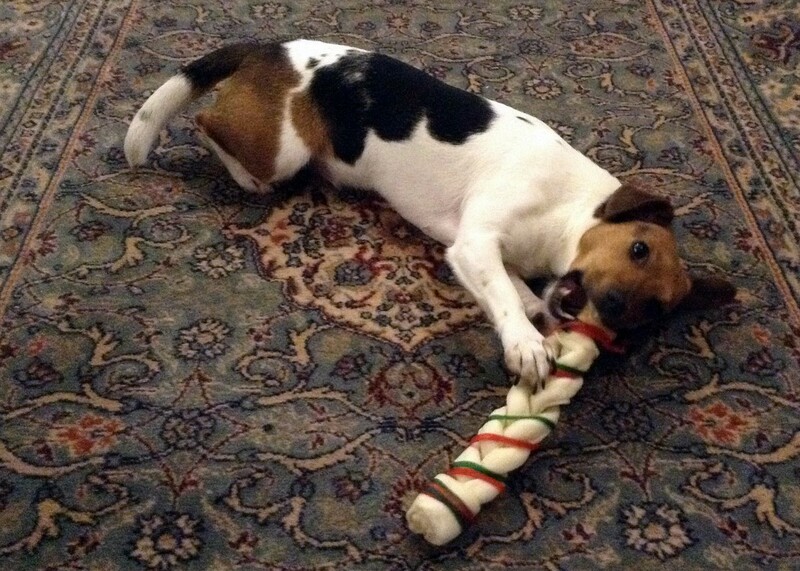 Is Rawhide Safe or Bad for Dogs? 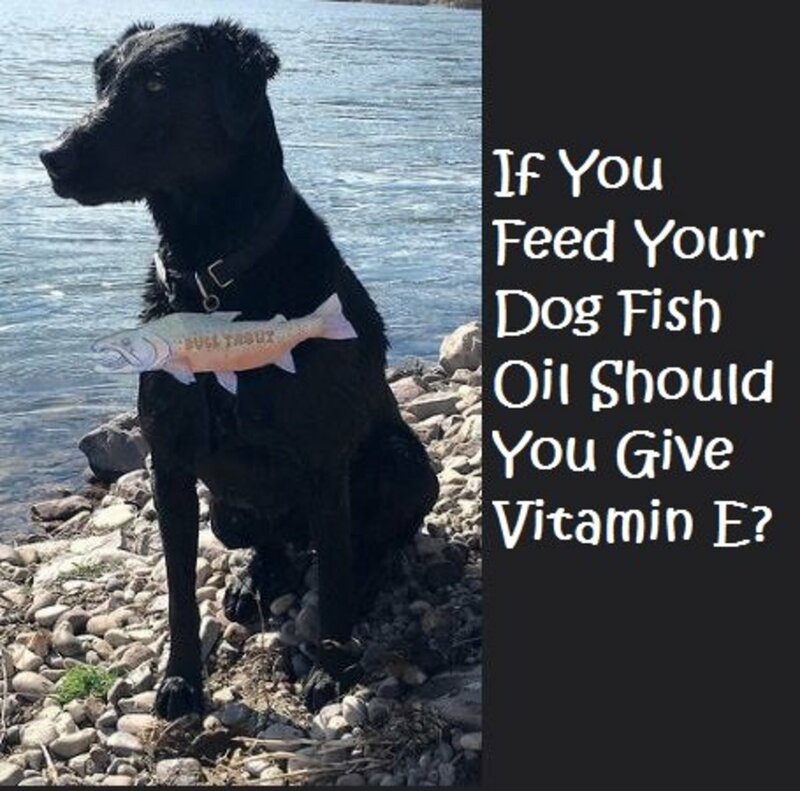 If You Feed Your Dog Fish Oil Should You Give Vitamin E? Cynthia ... you are so sweet! Thank you! Thank you so much for this great recipe! My dog LOVES them, and i am thrilled to be able to provide them so much more economically. 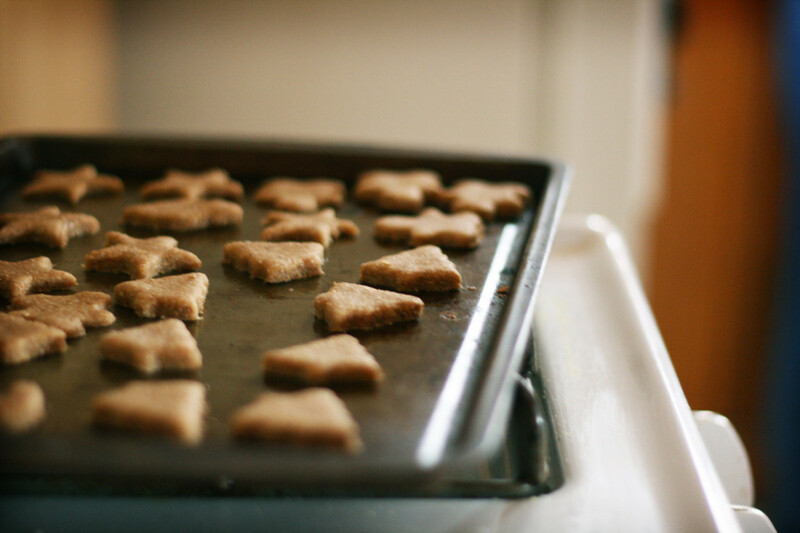 I got 20 good-sized (about frosty paws size) treats out of this recipe for $4.00 US! Now that is QUITE an improvement - thank you again! hey there! checked out your wsiebte and am very interested in your assistance. We have a year old lab X greyhound (so we found out afterwards!) and all in all he is an amazing dog, we got him at 8 weeks and he has been around our daughter who had just turned 3 and is amazing with her she lays on him..pushes him is kind of in an aggressive stage right now and we try really hard to stress to her NOT to be like that lol but anyways he has never growled, snapped, bit or snarled at her..or anyone for that matter.. he is a very loving and affectionate, licky/kissy dog.however, we have a baby on the way, and my husband was just called into the military and will be going away for quite a while. Bentley(dog) seems to listen to my husband more than me they are BFFS. And Bentley has and always has had an issue with jumping up, and pawing at people lol not aggressively but its still super frustrating, and we are concerned with the baby on the way and such and just want to get him under control while hes still young.Let me know what you think and We'd love to meet! It is great when we can give them what they love without it costing a fortune! Thanks for telling me! I have two Siberian huskies and they love the frozen treats. I made one with just melted peanut butter and vanilla yogurt. I will trying it with banana next. Frosty paws are about $5.00 for four. The one I made was $5.00 for two and a half dozen. Can't wait to feed this to my dog. I will be trying this summer! What a fabulous idea!!! Thanks for sharing ... never know when someone else might need to do the same! This was such a great solution for giving our dog his medicine. He hates the milk thistle he needs to take for liver problems, so I broke open the capsules and poured a 12 day supply of his meds into the batter (I made half the batch). He loved the treats and was none the wiser! Thanks! Jennifer, thanks for such a great comment! If you have trouble cooling your dog down in the summer, you might also try unsalted homemade chicken stock that's been defatted ... you can fill a Kong with it (you have to plug the little hole first) with the defatted broth and freeze it. I did not know about Kefir at the time I wrote this article, but Kefir is even better for dogs (and people) than yogurt and has many more varieties of beneficial bacteria. Loved your comment! I can't wait to make these! If it wasn't storming here I would be at the grocery store getting the ingredients! I will be picking them up after work tomorrow! I tried the ones from the local grocery store for the 1st time because my poor dog is always hot in the summer. I can't get her to drink water when she's hot. I put a gallon of water in the fridge for her, I have added ice, & she always has fresh water. I know she'd cool down faster if she'd drink. Anyways, I figured they'd be perfect for her. I take care of my mom's dog too, who is sensitive to different foods, so 4 were gobe quickly. My dog couldn't keep the cup still so we sat in the floor & she licked it clean. Afterwards I she laid on me & gave me tons of kisses. She really loved it so I wanted to start making them at home. Anything to make my baby happy! She shows me she is thankful anytime I do something for her & this is my way to thank her for being such a great dog. I can't believe the hate in some of these comments. It worries me that they have a dog in their care. You are doing something nice to help us & they have nothing better to do than be rude. It's unfortunate that some people don't have common sense to wash things before putting their dog's food in them, check labels before using the products since everything has different makers with different ingredients, to not use an entire bottle of garlic powder or onion powder, & so on. If you're going to own a pet, do your homework. Know what's dangerous for them & know the quantity on which it's dangerous. You don't rush your dog to the vet if it ate a chocolate morsel or had a bite of your pizza. Also, you don't feed it an entire onion or bowl of milk. This is why dog food companies that use horrible ingredients stay on the market. People don't educate themselves on their pets. I feed my dog a good brand. It's not the most expensive but it has similar ingredients. Since treats are given in moderation I am not as picky but definitely keep an eye on the ingredients. Some things are OK in small amounts but not as a meal. These ice cream treats are to be fed in moderation, not as a meal too so a small amount of some of these items are safe as long as the dog isn't allergic or sensitive to some ingredients. A vet recommend plain yogurt to my friend for a dog with an upset stomach. She told me this after I was having trouble with my dog getting sick. I was hesitant at first but finally gave in because I needed to try something else. It worked great! I don't know why it did but since then her stomach hasn't been as sensitive as it used to be. It go's to show that it's good to do your own homework not listen to hearsay. They do need to stay frozen, but you can un-mold them and bag them up in the freezer! Do they need to stay frozen or can you bag them up and keep them in the fridge? 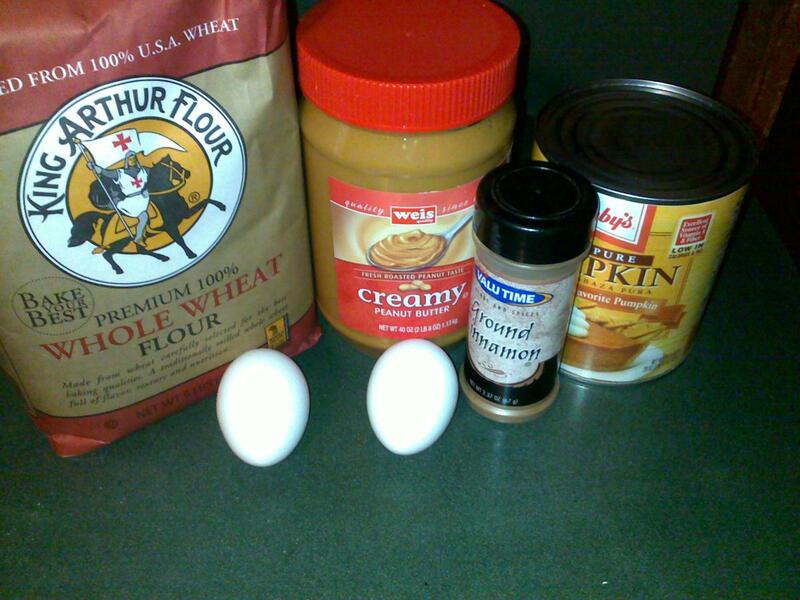 I have another great treat recipe that uses cat food "flour" lol. Never mind the dogs.....my boys would love these! thanks!!! Great idea! I've got a non stick mini muffin pan that would probably work well. Thanks! Freeze them in Muffin Tins! I did the first batch in ice cube trays, but my dog picked them up and chomped them in one bite! I did the second batch in muffin tins so she couldn't pick them up, and it worked like a charm! 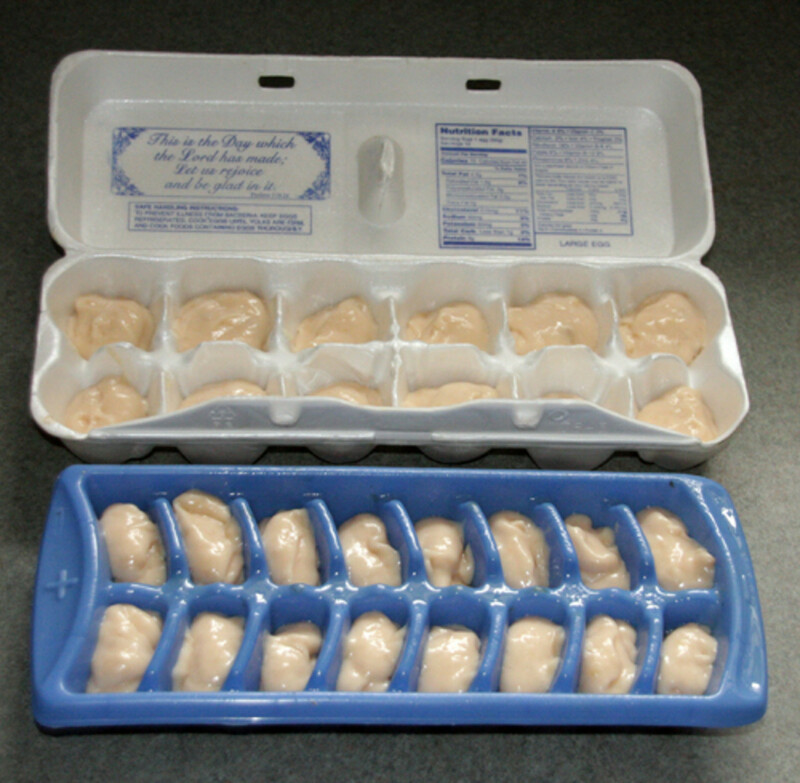 Hi, I don't know if anyone else mentioned this but if you use the egg carton to freeze the "popsicles" you should wash it first. As you mentioned raw eggs may contain salmonella which may also be on the outside of their shells and could be transferred to the carton. Great recipe, thanks! You are so welcome! Thanks for stopping by! My pup is going to love this. She loves licking my yogurt bowl and she loves peanut butter. Cannot go wrong with this! Thanks for posting! Gonna try these for my puppy who is teething his k9s. He hasn't been eating as much as he did a week ago due to his sore mouth. Hopefully these will help sooth his mouth. You are the second person to mention additives to meat baby food. I had some here last week, both beef and turkey. The only ingredients they had besides meat were water and cornstarch! However I appreciate your comment, because there are no doubt different brands sold in different parts of the country and perhaps it is just that what I have at my local stores here in North Carolina lacks additives. May the buyer beware! Thanks for taking the time to comment! I made these awhile back and my dogs couldn't get enough of them. My golden was eating them whole. I did want to point out that if you are using baby food as a substitute, some meat versions have onion or garlic in them. This is not good for your dog and it may seem like a little bit but it adds up in the course of your dog's life. No, that is NOT inexpensive! Perhaps it is time I update this hub! Thanks for stopping and taking the time to comment! I can't wait to try this. I have 3 dogs. Frosty Paws are not inexpensive as you suggest, $5.00 for a box of 4 little cups is expensive. This would be an inexpensive way to make frozen treat for my dogs. 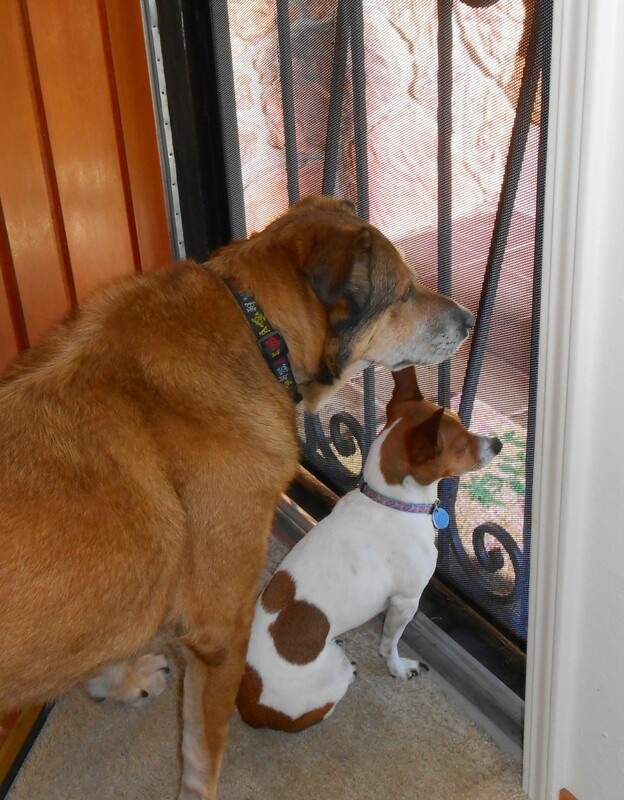 @ Brett and @ Jaime, I am in NC too and we have Boxers which are heat sensitive, so my dogs love a freosty treat. Where in NC are you? I am north of Raleigh myself, and it HAS been hot. I hope these will help give your dog a nice relaxed transition into the hopefully on its way autumn! I'm so excited to try these! We live in NC and our dog loves being outside, but since she's black she can only stay outside for a little while before taking a break to cool off in the AC! These will be a good cool down when she comes in! Thanks for posting! Love pets ... thank you so much for taking the time to try the recipe, and so glad you are enjoying! Have a wonderful day! Thank you for your sweet comment! Do let me know what your dogs think of the homemade "frosty paws"! thanks so much for the input treats are getting expensive with this heat we're having since we have two dogs I will definitely try your recipe. I am so glad! It is always wonderful when you can provide the same thing for a fraction of the price! Enjoy and stay cool! The one I use is 100% beef with sufficient water for processing, etc. etc. but no onion! I agree though, that label reading is important, for canines and people! You shouldn't generally feed your dogs baby food unless you read the ingredients closely. Onion is not good for dogs and many baby foods contain either onion or onion powder. I was looking for something similar on another site, very good article about your hub. Love the sweet potatoes and chicken idea!!! Great recipe! My dogs LOVE them. I had been making something similar with yogurt, sweet potatoes, and chicken pieces. Angela ... thank you so much! My dog looves these..,more than frosty paws! :) thanks for all of the variations too...this has gone down in my idea book! That's a good point ... I should modify the article. I guess it never occurred to me anyone would feed this to puppies! It seems enough just to wean them from mother to solid food ... but people will do anything. Thank you for posting! Found this via Pinterest. Please make sure not to feed these to puppies. Much like babies, puppies could die from the botulism in honey. I am so glad they were appreciated! I just made a batch for my weimaraner with yogurt and chicken w/ apples baby food. The whole time I was mixing he was staring and drooling. I decided to freeze them in my small muffin pan since it was about the same size as Frosty Paws. I think he approves so far since he helped with the clean up. Kimberly, this is a treat and not a primary diet. However, there is protein in both peanut butter and in yogurt! Just give it a whirl and see if your canine approves! The hotter the outside weather, the better! I like the idea of making them myself, however I thought one of the main ingredients was crude protein and that is what they needed. I'm so glad they liked them! I once had a dog that ate muffin wrappers, lol ... so your comment made me smile in memory! Kris ... My dogs love sweet potatoes ... they'll steal them from the box I buy each fall and take them outside and gnaw on them like bones. Thanks for the great suggestion! OK, I made some for my three dogs, a beagle, a black lab, and a newfie mix. They all LOVED them, the newfie so much that he ate the paper cup!!! I made these for my dogs with your original recipe and I did one with yogurt and sweet potato baby foot and she loved both. The only problem was that she tries to swallow them whole and then chokes, so the second time I made them in small cups so she has to lick it out. Thanks for affordable alternative to Frosty Paws! LOL! I know what you mean. The best dog treats have only human ingredients, at least in my opinion. Glad your furry friend enjoyed them!!! Ha very nice. Thanks for your blog. Taylor, theoretically, yes. However my experience with puppies is that their digestive systems are responsive to dietary changes and if it were me, I'd wait until they were a bit older before introducing anything this different from their normal fare. The worst thing that could happen is that you'd get soft stools, so if you might try giving your pup a TINY bit and then watch to see what happens. Some puppies appear to be more sensitive than others. I hope this helps! can 6 weeks old puppies eat these?? Correct! It's like doggy "ice-cream!" So you don't cook these? Just freeze and give them to the dog? Jenna, I'm so glad! They will be especially nice to make as the weather continues to get warmer .... thanks for the comment! My Lab loved these! I used the small tupperware containers (about the size of frosty paws) and she just gobbles it up! This is awesome! Would love to add this to my e-cookbook for subscribers of dealwagger.com. I will e-mail you. Anyone trying to figure out what to put them in. The 4 ounce OXO baby food containers work perfectly. And my lab doesn't chew them at all when he's eating his HM Frosty Paws. Crystal, thank you so much for your sweet comment! My dogs really like these, and I live in the South where it can get pretty hot in the summer. It is nice to have something to give my dogs as a cool treat while I eat Popsicles and drink smoothies! I appreciate your taking the time to comment! Just made these and so far, my Boxers loved licking the bowl after I put them in an egg carton and mini round freezer containers that are about the size of Frosty Paws. Can't wait to save money and give my dogs healthy treats this summer after our walks! I like that idea! Thank you for the nice comment! We make these at my work, I work at a dog kennel. We stick dog treats in the middle. I am absolutely impressed with these treats! A friend just told me about this article, which by the way is very well written, and I plan to make them over the weekend! Thank you for taking the time to share it with us. Sometimes people may or may not like what their reading but for the sake of complaining they will dislike anything. My dogs will go crazy for these treats! I have to try some of these yummy recipes out. My dogs thank you! Frosty Paws here in GA are $3.49 for a box of 4. I don't consider this to be expensive. They are for a special treat for my dog, not an every day snack. That being said, I love the homemade recipe. My German Shepherd loved it and I like that I control the ingredients that go into it. I am a firm believer in feeding him No preservative, No chemicals, No additives, so we use all organic products for him. Thanks for posting this recipe. Paisley's Mom ... so glad your baby likes these! At two, I would say she is still a puppy, but hopefully a "mature" one, lol. I had not thought of using this as a Kong filler ... thanks for reading, the comment, and the great idea! My do loves these! She is a very active puppy lab (okay so she's actually 2 years old, but still has the energy of a puppy!) I make these and then shove them way down in the bottom of her kong and then she has to work to get it out! I've also started putting a dog cookie in the ice tray after I fill it 1/2 way and it's even more challenging! Csea, thank you for taking the time to stop by, read my article and to comment ... and then to take on the naysayers ... wow, I am touched! Thank you so very much! You're one of those people who makes the world a brighter place. I hope your dogs enjoy the treats! Thanks for taking the time to post these great ideas! Can't wait to try a few. Also, I read a few of the comment entries. I can't believe how rude some people are. Folks...if you don't like the ideas or recipes..don't use them. Just shut up and move along. This blogger has taken time to share ideas with you, no one is twisting your arm to try them. Carrie, you are welcome! I hope your dog will enjoy these equally well! My dog LOVES frosty paws!! Thank you! Great suggestion (even sounds like a great people treat!). Definitely will give this a try (for the doggies, not me) and without the 15+ extra added preservatives and ingredients. Thank you. My husband's and my first dog...an Irish Setter...used to love munching on ice cubes. He would have LOVED these homemade frozen dog treats! I used to make homemade dog food and dog biscuits but never thought of making frozen goodies for them. Will keep this in mind for future reference. Your variations sound great! It is no wonder you got a hub of the day mention. Congratulations! Up and useful votes. I'm only talking about a sprinkle for flavor, dogs love garlic. It's like chocolate ... if you feed a dog a bar of dark chocolate, you might be in trouble. A taste of a chocolate chip cookie or a last bite of chocolate cake does no harm. Since I posted this article, I've discovered, kefir, and use it in place of the yogurt. The beneficial bacteria in homemade kefir partly digest the proteins and use up the lactose ... it is actually quite good for them. 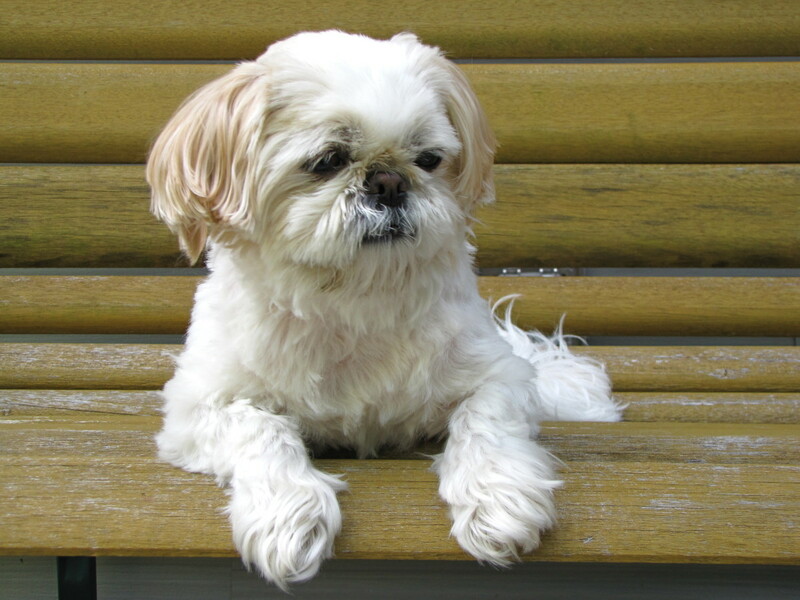 I read recently where a vet attributed a dog's recovery from hip surgery to the kefir his owners fed him in recovery! actually, garlic and dairy are bad for your dog. be careful if you're going to use it and know the risks. 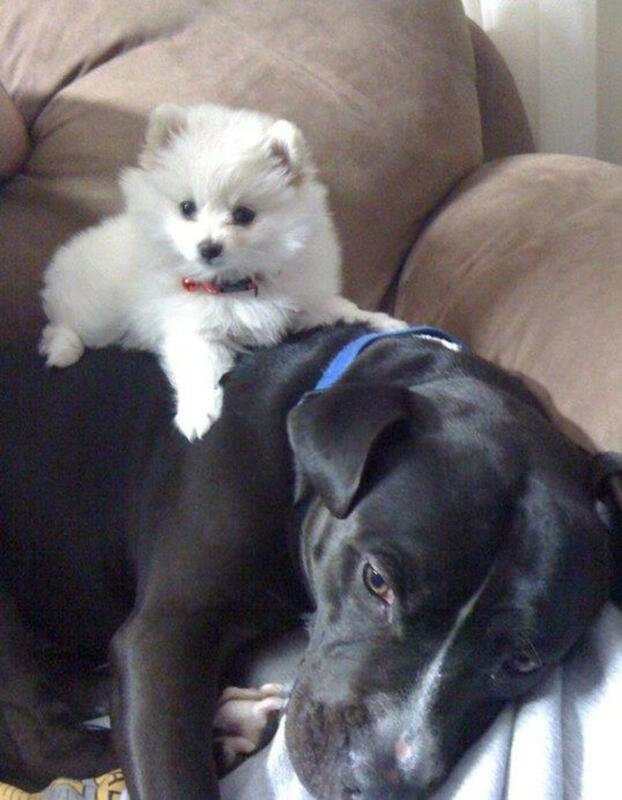 Pups! I am happy to read this. Thank-you, Brett! my dog loves this and as well as all his friends in the neighborhood! All 3 of my dogs loved Frosty Paws, will give the recipe a try, thanks. Great ideas. And something new to try. Congratulations on Hub of the Day! I'm going to bookmark this and give it a try. Congrats on hub of the day! I just wonder--does the yogurt and honey not have too much sugar in it? I know sugar isn't good for dogs. What do you think? Thanks! I am glad I am not a dog, they look gross. I would never give them to my do, based on looks alone. Raw Veggies and fruit make great treats. Wow what a good stuff. Thank you for your posting such a dog lover. Interesting and sad. It is only sad as I had to put my pup to sleep after 14 years. She would have loved these! Yes, I know all about Frosty Paws. (Expensive too) I have 3 dogs. Well, one is actually a "Grand dog" who visits frequently in summer. I will keep this in mind and Congrats on Hub of the Day! Congrats on getting Hub of the Day! Great idea for a hub. I don't have a dog, but I know that this will be useful for dog owners. Thanks for including so many variations.